So the day has finally come for you to move out. All the packing has been done, and the only thing left is that dreaded final cleaning of the place you used to call home. This is the point where some of you might start to regret having skived off on cleaning in the past. Yet, not all hope is lost. With a little bit of prudence and a lot of elbow grease, your apartment will be as good as new when you're done with it. Walls are one of those things that we never ever think about from day to day, yet tend to accumulate more dust and dirt that we could ever imagine. If you live in a humid climate, there is a high chance that lots of mold and slime is already festering on your walls, especially if they are bare concrete without a single coat of paint. One simple way to clean concrete walls is to use a paste of baby powder and water and apply it to stains, and then scrape the paste off when it dries. For more stubborn stains, it may be wise to engage a contractor. For those who have wallpaper, it might sometimes be the best option to skip on cleaning entirely and get the wallpaper replaced by an experienced contractor. 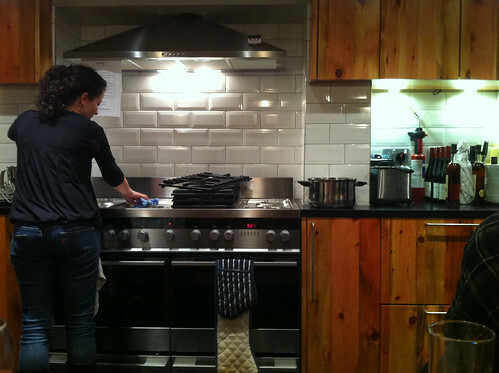 Even if you did not cook a lot, the kitchen is one of those places that just have its own way of accumulating grime. The kitchen sink, in particular, is a hotbed of germs and slime from food scraps past and present. If you have hitherto been diligent with your cleaning, the kitchen should not be too much trouble. Scrub the kitchen sink, with abrasive paste if it is stainless steel to get rid of stubborn stains, and clean the garbage disposal if you have one by pouring sink cleaners in and running the disposal for a minute or two. Vinegar is an environmentally friendly way to restore the shine to your stainless steel sinks and taps after a good cleaning. However, if this is the first time you are attempting to clean your kitchen sink, try pouring a mix of baking soda and vinegar into the sink first, and let the foam do its job before you dive in with a stiff brush to scrub all that grime away. The oven is another potential problem, especially if your cooking repertoire consists mainly of greasy roasted meats. Use a couple of bottles of oven cleaner to get it reasonably clean, then clean off all remaining debris with a paste of baking soda and maybe some kosher salt for additional abrasive powers. Like the kitchen, the bathroom is a moist and damp place that is at risk of growing mold and pink slime. Pink slime, once established, can never be got rid of permanently, though regular cleaning should be enough to ensure that its spread is kept to a minimum. For most parts of the bathroom, all-purpose cleaning solution and a decent amount of elbow grease should be enough to get things back to a sparkling state. Once again, a paste of baking soda and water will help to restore dull porcelain sinks and cisterns to their original shiny state. However, if you have somehow managed to clog up your sink or your toilet, it would be wise to call in a professional cleaning service to help you with your bathroom cleaning before you finally move out. For many people, floors are often a tricky issue. Most of it depends on what kind of floors you have. Hardwood floors and linoleum tiles require completely different cleaning methods, so ascertain that your floor is what you think it is, before proceeding to clean it. As a general rule of thumb, refrain from using wet cleaners and mops on hardwood floors. A damp cloth should suffice to remove most of the dust and dirt that is on your floor, and some polish should be enough to ensure that your floors are as good as new. For linoleum and concrete floors, a wet cloth and some all-purpose cleaners always work. Always make sure that your floors are completely dry after you clean them, lest mold start growing. For trickier types of flooring such as parquet or ceramic tiles, hire a professional cleaning team if your budget allows it. These types of flooring are easily damaged, and to repair them can result in hefty costs. Your money would be better spent on hiring a cleaner in such cases. By now you should have realized how tedious the cleaning process will be when you intend to clean it before moving out. We at Eve Environmental Services can help you with this arduous task at a reasonable price so talk to us today about it! Copyright © EVE Environmental Services. All Rights Reserved.